Where Have I Been was originally posted on April 26, 2007. Frustration rattles through the organ pipes of my Internet connection. Where have I been and what the hell was I trying to do? Lures tied, standing on the shores of everything in the world with my copy of how to fish like a librarian, I cast and cast and cast into the ocean that is the Internets. I found something I wanted to share...but then I found something else. Related, yes, but slightly different, just different enough that I could write about the both and spin a fabulous tale. Then a third linkity presents itself and I am lost in the tubes. In my haste I have failed to establish a basic principle of navigation. Where have I been? If you do not know, most likely there are two reasons. 1. The site you are on does not have a usable method for you to answer the question, or 2. You do not remember. I have been so wrapped up lately in thinking about the former that I overlooked an interesting piece concerning the latter. "Climbing into the back of a car with black windows, telling something to the driver, allowing the driver to take you somewhere, and then getting out and looking around. You have no idea if where you are is where you wanted to be, how you got there, what the driver looked like, or how he found his way. You have no sense of space other than your immediate surroundings and what you can remember of why you came this way." An overlooked factor in the issue over Where have I been is the bridge between user sessions. Yesterday I found something, what was it again? Oh yeah...I searched for foo and then found an article for bar and then I clicked this thingy and viola. Phone calls to friends at computers while you are on the road or at a bar often fall into two categories, bets or directions. Either one usually demonstrates how the caller maintains location awareness between sessions. "It should be somewhere around the fourth or fifth thing listed." "Look up on the top right. One of those thingies is the link I need." "Ok now scroll alllll the way to the bottom and click the link next to the word: sponge." What happens if you do not make a physical link such as a shortcut? If you are the type of person that auto-dumps all of his data except saved passwords. What fabrications and structures must go up in your mind to hold on to that ephemeral link you danced through on your way to lunch? Honestly, I had a gem yesterday. Today I am left with the incredibly interesting second-clicks. 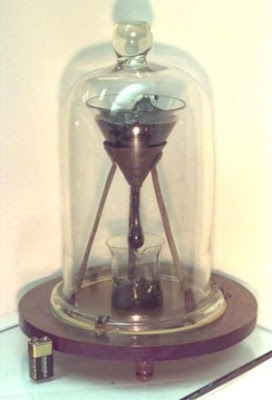 The pitch drop experiment is a long-term experiment which measures the flow of a piece of pitch over many years. The one I stumbled across was started in 1927 and has had all of 6 drops hit. This novel bit of experimental lore is where I landed. I haven't the foggiest idea why I was looking at the viscosity of materials...other than...wait! wait! I DO remember ! And now the pathways have all been rebuilt. After hours of trying to stitch together a weak article on why prior location is so important, the last vestiges of Where have I been fire up like the last ember at the bottom of a campfire. I was thinking about glass. Specifically, I was curious about how the wikipedia project handled the severe misconception that glass is a liquid. It turns out, they get it right. After confirming that in my mind, I promptly forgot about it and stumbled across: glass versus pitch. Which led to the University of Queensland experiment which led to the thing I actually wanted to write about. Sigh...I suppose I should start social-bookmarking. Then everyone can tell me where I have been. The Darwin Awards garner attention every year for the fantastic methods used by the winners to remove themselves from the gene pool. The Golden Raspberries are delivered near the end of Oscar season to highlight spectacularly bad contributions to the film industry. There are a few other satiric awards that deserve attention, chiefly the Stella, the Bent Spoon, the Pigasus, and the Ig Nobel. "The Stella Awards are named after a woman named Stella Liebeck who, in 1992, spilled a cup of McDonalds' coffee onto her lap, burning herself. She sued McDonalds and was awarded $2.9 million in damages, subsequently reduced by the judge to $640,000. The Stella Award is given to people who have what the originators consider to be outrageous lawsuits. The awards are the subject of a 2005 book, The True Stella Awards: Honoring real cases of greedy opportunists, frivolous lawsuits, and the law run amok." The Bent Spoon award is given in Australia to such nutters as Jasmuheen the breatharianist, a "researcher" in the field of pranic nourishment (living without food). "The Bent Spoon Award is an award given by Australian Skeptics, 'presented to the perpetrator of the most preposterous piece of paranormal or pseudoscientific piffle'. The name of the award is a reference to the spoon bending of Uri Geller. Although awarded yearly since 1982, only one copy of the trophy exists, as 'anyone wishing to acquire the trophy must remove it from our keeping by paranormal means,' and no winner has yet overcome this obstacle. Winners are notified by telepathy." 1. To the Scientist who said or did the silliest thing relating to parapsychology in the preceding twelve months. 2. To the Funding Organization that supports the most useless parapsychological study during the year. 3. To the Media outlet that reported as fact the most outrageous paranormal claim. 4. To the "Psychic" performer who fools the greatest number of people with the least effort in that twelve-month period. And finally, my favorite, the Ig Nobel. For achievements that "first make people laugh, and then make them think." These things are fantastic. Why woodpeckers do not get headaches, an electromagnetic teenager repellant, and one of my favorites: "Consequences of Erudite Vernacular Utilized Irrespective of Necessity: Problems with Using Long Words Needlessly," (Daniel M. Oppenheimer, Applied Cognitive Psychology, vol. 20, no. 2, March 2006, pp. 139-56.). The University of Queensland won an Ig Nobel in 2005. This is science at its very best. Ultrasonic velocity in cheddar cheese! Pressures Produced When Penguins Pooh -- Calculations on Avian Defaecation! Blinded by science, stunned silent by science, and in some cases frightened oh so frightened into a corner muttering why? why would you ask that? by science. It was the Ig Nobel site I had stumbled across several days before. Since then I have lost precious hours at work and at home. Burning candles to nothing while taking in as much as I can, including this gem about inattentional-blindess and a woman in a gorilla suit. And, with that, I will leave the piece of tubular exploration with the following quasi-upbeat aphorism. I may yet be lost, however...I know where I have been.